Emerging Sources Citation Index (ESCI), MEDLINE/PubMed, Scopus, EMBASE, Chemical Abstracts Service/SciFinder, ProQuest, ChemWeb, Google Scholar, EMCare, Genamics JournalSeek, PubsHub, J-Gate, MediaFinder®-Standard Periodical Directory, CNKI Scholar, Suweco CZ, TOC Premier, EBSCO, British Library, Ulrich's Periodicals Directory and JournalTOCs. Manuscripts submitted for publication in Bentham Science journals are subjected to single blind peer-review, except for a selected number of patent journals where double blind review is followed. Single blind reviewing maintains the identity of the reviewers, not disclosing their names to the authors. The anonymity of reviewers ensures objective and unbiased assessment of the manuscript by reviewers. 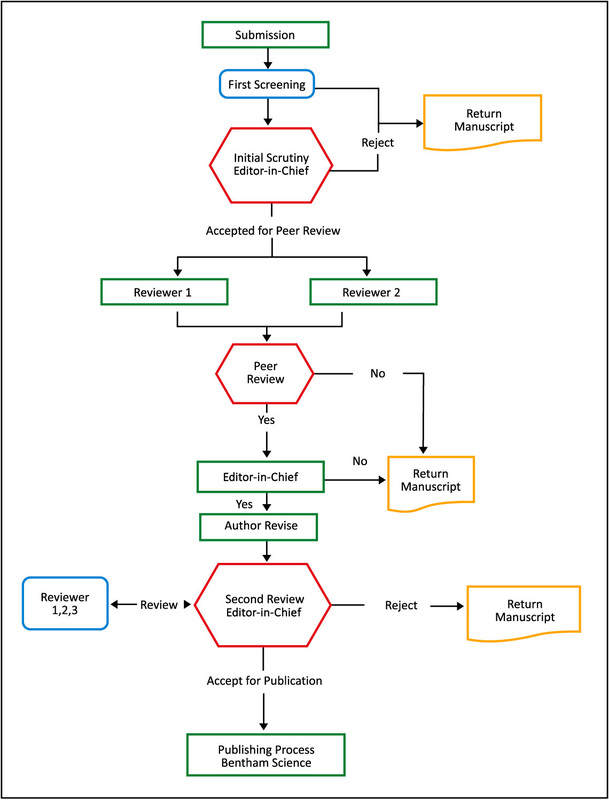 Reviewers are advised to consider the following important aspects of a manuscript when conducting the review. The results reported in the manuscript must be original and authentic work of the authors. They should be devoid of any plagiarism and the material should not have been published earlier. Studies which report some reproduced results, for example a new clinical trial, may also be considered for publication. Experiments and other analyses should meet the recognized technical standards and must be described systematically. The research presented in a manuscript should facilitate in reaching accurate conclusions from the statistics. Methods and experiments as well as reagents should be documented in detail. Authors should present and interpret the results and conclusions in an appropriate and comprehensive manner, clearly explaining the results and outcomes of their study. Incomplete interpretation of results may result in rejection of the manuscript. The manuscript should be written in English in a clear, direct and active style, free from grammatical errors and other linguistic inconsistencies. All pages should be numbered sequentially, facilitating the reviewing and editing of the manuscript. Authors should seek professional assistance for correction of grammatical, scientific and typographical errors before submission of the revised version of the article for publication. Professional editing services may also be sought by the team available at Bentham Science at an extra charge. The research must meet the highest applicable international standards of the ethics of experimentation and research integrity. A brief description on ethical guidelines is given in the ‘Instructions for Authors’ of every journal published by Bentham Science. The manuscript should adhere to suitable reporting guidelines (e.g. CONSORT, MIAME, STROBE, EQUATOR) and community standards for data availability. Bentham Science seeks to disseminate research and therefore stipulates that the public deposition of data is as per the followed standards (for example gene sequences, microarray expression data, and structural studies). Other similar standards that may be applicable should also be followed. Is the manuscript written comprehensively enough to be understandable? If not, how could it be improved? Have adequate proofs been provided for the declarations? Have the authors addressed the previous findings fairly? Does the paper offer enough details of its methodology to reproduce the experiments? Bentham Science encourages authors to publish detailed protocols as supporting information online. Do any particular methods used in the manuscript warrant such a protocol? The peer-review of a manuscript is a confidential process. Reviewers should keep the whole process completely confidential. They should consult the EiC/Senior Editor and obtain permission before consulting another colleague for help in the peer-review of the submitted manuscript. Reviewers should not disclose any information whatsoever to anyone before publication of the manuscript.